Just as we all crawl back out from in front of the nearest big screen TV to have to face the world for another eight months without Seahawks football (for which we, here at your Sunday Ballard Farmers Market, thank the NFL, cuz it gets kinda lonely here on game day), I must remind you that it is time to make plans for that special someone in your life who is already wondering what your are going to do for them this year. No pressure! Yes, Valentine’s Day is coming up this week. Why not get a jumpstart on the gratuitous, if not greeting card company induced, love fest this year with a bouquet of fresh tulips from Alm Hill Gardens? And if you get buds that are still pretty tight, they’ll be in full bloom come that magical day. Baby spinach from Colinwood Farms at Ballard Farmers Market. Copyright Zachary D. Lyons. Hey, I love root vegetables and kale just as much as the next guy, but it is nice to know that Colinwood Farm in Port Townsend is looking out for our culinary sanity by offering us something else out of their greenhouses this time of year. Like this beautiful spinach. No, this is not a stock photo taken in the summertime. This is an honest-to-goodness February image. Enjoy! Pink Lady apples from Collins Family Orchards not only help keep the doctor away all winter long, but they also are just plain delicious! Still plenty crisp, they are one of my favorite eating apples. First of the new year sheep’s milk yogurt from Glendale Shepherd at Ballard Farmers Market. Copyright Zachary D. Lyons. The ewes up on Whidbey Island are making milk again, and that means more fresh sheep’s milk yogurt from Glendale Shepherd! I love this stuff. It is part of my morning routine year-round. And I love how the flavor changes with the seasons. You can actually taste the changes in the forage the sheep eat. Having trouble getting a reservation for Valentine’s Day? Why bother? Make dinner at home! We’ve got the spinach salad and flowers covered above. Grab some fresh artisan pasta made with market-fresh ingredients from Pasteria Lucchese for your main course. They have a wonderful selection of pastas from which to choose, they can give you tips on how to prepare it, and they even have a great lineup of sauces, too! Gift box of dairy-free truffles from Soulever Chocolates at Ballard Farmers Market. Courtesy Soulever Chocolate. How about a nice box of dairy-free chocolates for that special someone, even if that special someone is you! Made by Soulever Chocolates in West Seattle, they are made using many local, and always the best, ingredients! Don’t forget the love for Fido or Mittens! Stop by Porter’s Pride and check out their raw diet pet foods for cats and dogs. Made with human-grade, locally-raised meats and other ingredients, this is food you can feel good about feeding your four-legged loved ones. And they will slobber and shed all over you with affection in return! Sunday, March 2nd: More Spinach, Salad Mix, Local Cornmeal, Brisket & More! Fresh spinach from Children’s Garden. Photo copyright 2013 by Zachary D. Lyons. Well, it’s snowing in Bellingham again. Good thing we’re not in Bellingham! Cuz we’ve got fresh spinach here at your Ballard Farmers Market. Yup, Children’s Garden has begun to harvest its winter crop of spinach. Spring can’t be far off now! Children’s also has mint and cilantro now, too. Yay! You know what else is not far off? St. Patrick’s Day, that’s what. And if you want corned beef that is head and shoulders above the vac-packed stuff in the Big Box stores, why not corn it yourself? Skagit River Ranch has lots of beef brisket available right now just for that purpose. But don’t wait another week to get it. You need to get it today! Why? Because properly brined corned beef takes up to 10 days. Spicy salad mix from Colinwood Farm. Photo copyright 2014 by Zachary D. Lyons. 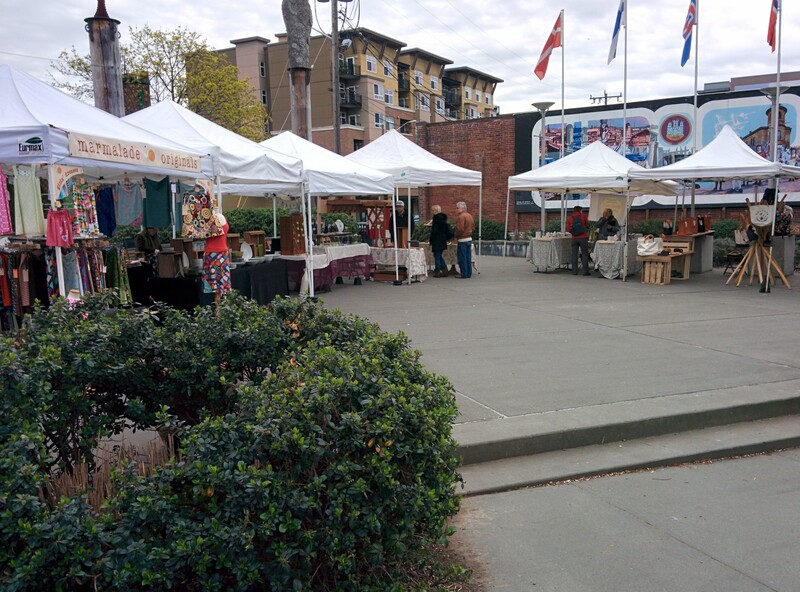 In the meantime, let’s get our salad on again, Ballard Farmers Market style. Colinwood Farm’s spicy salad mix is hitting its prime right now, flush with lots of tender, spicy mustards, arugula, hearty greens and more. You’ll never have a dull mouthful, and your body will thank you for it! Freshly-milled Yellow Dent cornmeal from Nash’s Organic Produce. Photo copyright 2014 by Zachary D. Lyons. Certified organic D’Anjou pears from ACMA Mission Orchards. Photo copyright 2013 by Zachary D. Lyons. ACMA Mission Orchards still has plenty of great, certified organic apples and pears from the fall 2013 harvest. They’ve got about a dozen different varieties still, including these D’Anjou pears. Great for the lunchbox and to keep the doctor away. Bagels from Grateful Bread Baking. Photo copyright 2013 by Zachary D. Lyons. Fromage blanc from Mt. Townsend Creamery. Photo copyright 2009 by Zachary D. Lyons. …some fromage blanc from Mt. Townsend Creamery. Or better yet, try some of their truffled fromage. Beats the heck out of that stuff from Philly, and that is coming from a guy who used to live in Philly! Sweet yellow Spanish onions from Lyall Farms. Photo copyright 2012 by Zachary D. Lyons. Salmon lox from Loki Fish. Photo copyright 2009 by Zachary D. Lyons. … some wild salmon lox from Loki Fish. They lox up coho, keta and sockeye. I actually prefer the coho and keta to the sockeye. It’s all great, but I grew up in the East, and they use a milder fish than sockeye there for lox. Loki’s coho lox is the closest thing to it, while still being wild and local! And don’t forget to try out their salmon sliders! Siegerrebe from Lopez Island Vineyards. Photo courtesy Lopez Island Vineyards. I don’t know whether a bottle of Siegerrebe from Lopez Island Vineyards goes well with our bagel or not. I suppose, with its nice grapefruit finish, that it does have a kind of brunchy quality to it. Of course, you can decide for yourself , since Lopez is sampling its wines today at your Ballard Farmers Market. And did you know that siegerrebe grapes grow in the Puget Sound appellation? Yup. Lopez Island Vineyards grows them right on the island. They like the cool, damp climate. Breakfast burrito from Los Chilangos. Photo copyright 2013 by Zachary D. Lyons. 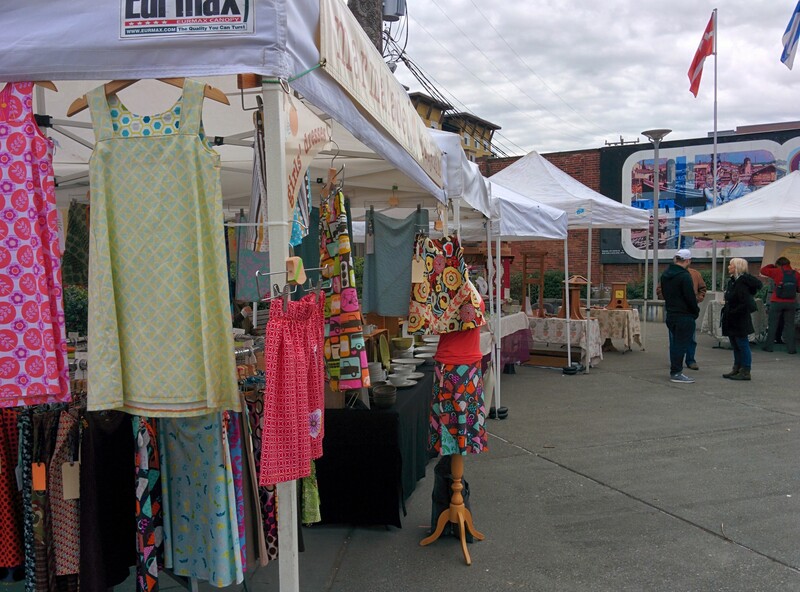 Of course, you could just get breakfast right here at your Ballard Farmers Market and eat it while you shop! Stop by Los Chilangos for one of their famous breakfast burritos made with Olsen Farms’ pork and Stokesberry Sustainable Farm’s eggs. Yummers!